Council chiefs have drawn up plans to protect William Wallace's tree. 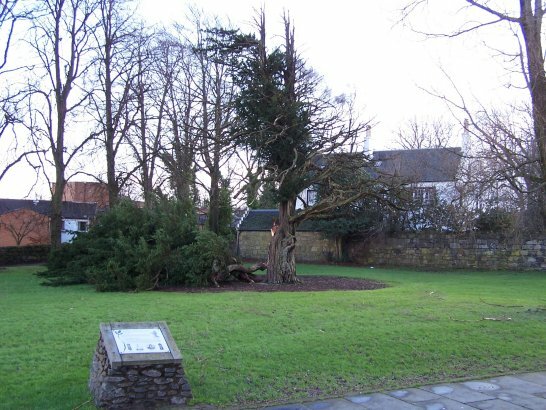 The Wallace Yew, in Elderslie, Renfrewshire, is thought to have been planted by the Braveheart hero around 1290. It stands 40ft high and 15ft wide. 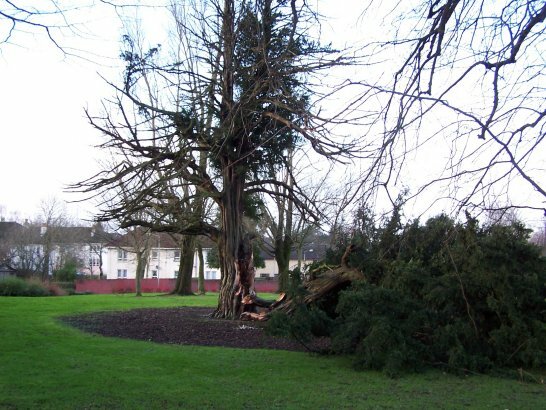 Officials at Renfrewshire Council have now launched an appeal for funding to protect the evergreen for future generations in a 4,000 survival plan. They want to erect a 6ft metal barrier to protect the remains of the yew from trophy-hunters, vandals and children climbing into it. The enclosure - which will include posts inscribed with ornamental thistles - will also provide protection for half a dozen saplings. They will be planted at the site, having been rescued from the gale-damaged tree. 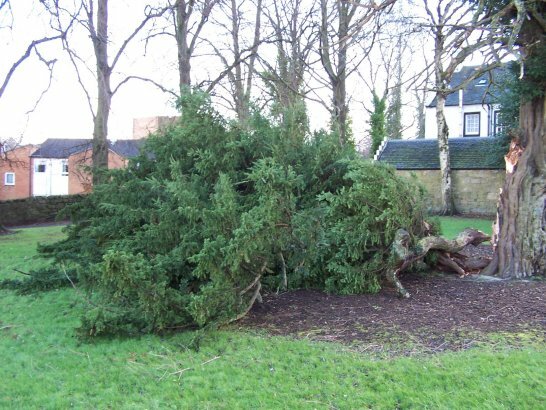 I am sad to report that the Wallace Yew has fallen in the terrible storms last night (12th January 2005). Although you can see from the photos that half is still standing, it is the dead half, and because of vandalism to the tree in the past, with half of it dead, it has not been strong enough to withstand the wind, and unfortunately it is the half that is still leaved that has taken the brunt. We have so little that we can truly connect with Wallace, that this tree at his birthplace, local legend connecting it with Wallace himself, is therefore very special. It is sheer bad luck that this has happened on the 700th anniversary of his death. Luckily there are cuttings that have previously been taken from this tree, and surely a replacement will be planted. This tree has witnessed every Wallace Day over the centuries, and it is like losing an old friend. The parks dept are not letting anyone approach it until an analysis has been made. Strangely the Wallace Oak which stood across the road fell in a storm in 1856. The Yew stood just to the rear of the Wallace Monument in Elderslie. The Wallace monument was unveiled on 28th September 1912 by Sir Thomas Glen Coats. It was designed by Mr J.C.Murray of Westminister. It is 37 feet high and the base is 20 feet above street level. Every August the Wallace Day parade takes place, with a march from Johnstone town centre to the Monument at Elderslie, where a service takes place. Renfrewshire Council have called in a consultant, who thinks all might not be lost. Some of what is down looks as though it is still attached to the trunk, and might be saved. It will mean getting in lifting gear, and somehow re-attaching to the trunk - bolting or strapping, the method is still to be defined. It will mean serious pruning of the live branches to reduce the load, and pruning of the whole to re-balance the tree. The Council do not yet know the cost of all this, but are committed to saving the Yew if at all possible. They deserve praise for their efforts here. It is supposed to be the tree William Wallace played in as a laddie - or a direct descendant of it. Now a cutting from it is to be among the less costly additions to the landscape around the new parliament building in Edinburgh. Supporters of the union with England should beware in case the Wallace Yew has the magical properties that pagans used to ascribe to such trees. Opponents of devolution should also be wary in case there is any significance to the yew's Latin name of taxus. Substantially cheaper than the building's 88,000 oak and sycamore reception desk, the sapling has been grown from the historical Wallace Yew tree at the heart of the village of Elderslie in Renfrewshire. It is due to be transplanted to the 15 million landscaping project which will finish off the 340m-plus parliament complex in ... well, whenever it is. The yew from which it has been grown is thought to be more than 300 years old. That would still leave it far short of having been a contemporary of Scotland's braveheart in the 13th century . But folklore and its location would suggest it was grown from the seed of the original tree at what is believed to be Wallace's childhood home. In David's words: "At the Elderslie, Renfrewshire site, two famous trees once stood, the Wallace oak, and the Wallace Yew. The yew alone remains. Some doubt has recently been cast on the antiquity of this tree, but parish records from the 1700's refer to it as "this ancient tree". As the oldest tree in Europe is a yew which stands in Fortingall in Perthshire and is over 3,000 years of age, it is interesting to think that this tree is named the Wallace Yew for other than the site of its location. The famous Wallace Oak which is claimed to have afforded shelter to William and his followers from an English patrol, finally fell in a storm in the 1800's. This ancient tree had been measured some years before its fall, when it was found that its branches covered 495 square yards!" Near the west end of the village of Elderslie, and on the south side of the turnpike road passing through it, a tenement of rather ancient appearance is pointed out as the house in which the renowned hero Sir William Wallace was born. But if this brave defender of his country was born, as is generally allowed, on the spot, it must have been in a habitation of older date. Adjoining this house is an old garden, from the foundation of whose walls, about thirty years ago, a stone was dug, bearing the following inscription cut in Roman letters, "W.W.W. CHRIST IS MY ONLY REDEEMER". The stone was taken to Elderslie House, the seat of Alexander Speirs, Esq. M.P., where it still remains. Near "Wallace's House", the name by which the above-named mansion is known, but on the north side of the turnpike road, stands the very celebrated tree called "Wallace's Oak". Many are the years that must have rolled away since this tree sprung from the acorn. About eight or ten years ago, its trunk measured twenty feet in circumference. Now, it measures only 14 feet and 2 inches. It was 60 feet in height, and its branches extended to the east 45 feet, to the west 36, and to the north 25, covering altogether a space of 19 English poles. It derives its name from having, as tradition affirms, afforded shelter to Wallace and a party of followers, when pursued by their enemies, in the same way as the Boscobel oak afterwards did to Charles II. It is also worthy of notice, that, in the garden of Wallace's house, there is to be seen a fine specimen of our Scottish yew, said to be coeval with, some say older than, the celebrated oak. But be this as it may, it is certainly of ancient date, and tradition has assigned to it the name of "Wallace's Yew". The names of several places in the vicinity of Elderslie confirm the opinion of that village having been the birth-place, or at least the dwelling-place, of the Scottish hero.